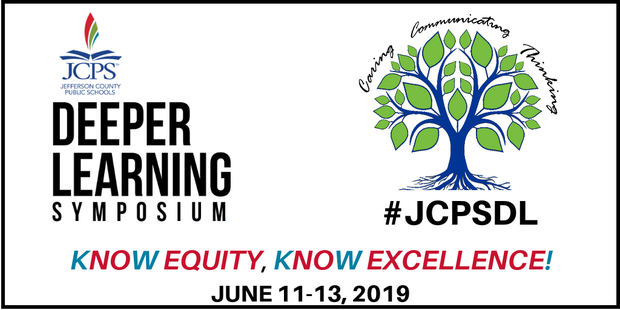 The third annual JCPS Deeper Learning Symposium 2019: KNOW EQUITY, KNOW EXCELLENCE! will be held from June 11 to 13 at the Kentucky Exposition Center in Louisville, KY. We are designing another powerful learning experience, building upon DLS 2017: Learning Redesigned and DLS 2018: Becoming the Change We Seek, to keep building our educator backpacks to transform the lives of every learner. This year, we are opening the DL Symposium 2019 with an Equity Institute on the first day of the conference to highlight the powerful relationship between Equity and Deeper Learning. Deeper Learning and Equity will continue to be strand throughout the Symposium, but we hope to elevate its connection right from the start! We are actively seeking Symposium session proposals focusing on Deeper Learning that engage, challenge, inspire while building collective capacity to deepen and strengthen learning for every scholar. To access the Planning Session Overview, click here. The submission deadline is March 18. Google Form to submit Symposium session proposal. All proposals are scored blindly. Please contact Alan Young. Thank you for your consideration and for all you do in education!